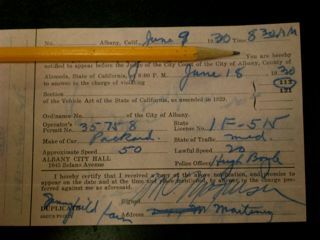 "Top Ten Pleas to Reduce Speeding Tickets, circa 1930"
Almost twenty years ago, a pick-up truck loaded with boxes pulled up to the History Center, then located at 610 Main Street. Brimming from the dozens of boxes were the remnants of one man's life: Sheriff R.R. 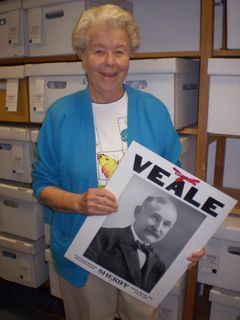 Veale, the longest serving County Sheriff in California history who served from 1895-1935. Since 1992, volunteers have been methodically sorting through the voluminous amount of material. Volunteer Betsy Glen in the "Veale Room"
Betsy Glen, a Wednesday volunteer, recently found a cache of letters and notes written by people in the 1930's complaining about being issued speeding tickets in Veale's county. So, why did people write to the Sheriff? Well, most people who speak of Sheriff Veale emphasize that he was a man whose "strengths lay in the fact that he always extended a helping hand to the needy" (1937 Contra Costa Gazette). So, as unbelievable as it sounds to us today, people wrote to Sheriff Veale in sincere hopes that he would either reduce the fine of the ticket or -- hold on-- pay the ticket for them and then they would pay him back. I'm not kidding, check out what I found in the letters to be the all time, top ten excuses. Do you think anything can be done to soften the burden any? Please see what you can do with this…. This gentleman is one of our County Committee men and I know would appreciate anything you can do in this instance. Will you see what you can do for him? He is a Lieutenant in the Navy and one good Scout. He is a very deserving young man of family and it would be a hardship upon him if a fine is levied. Is there anything which you can do for him? Such action would be appreciated by me. He is somewhat worried over this situation. Suppose the traffic officer should give me a ticket in Contra Costa County, what should I do? I wonder, could I ask you to be so gracious as to take care of this for me… hoping this will not inconvenience. I have always been told what a careful driver I am but it looks different now. I passed another car and speeded to do so. I did not argue with the officer as I didn't consider it a good policy. Please stop by and visit us at the History Center, now at 724 Escobar Street in Martinez. We are open every Tuesday, Wednesday and Thursday 9:00 a.m. to 4:00 p.m. and the 3rd Saturday of each month from 10:00 a.m. to 2:00 p.m.